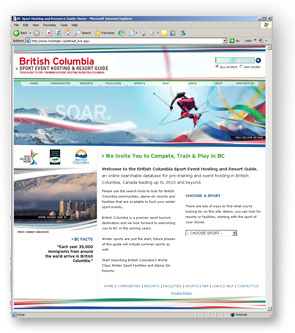 We’re thrilled to be part of the new British Columbia Sport Event Hosting and Resort Guide. It was launched today in Torino, Italy. We’ve been working with a fantastic team at 2010 Legacies Now, Tourism BC and the Ministry of Tourism, Sport and the Arts to create the site, the first of its kind. And here’s the press release about it.